Are you ready for the best Vegan Peanut Butter Cookies Recipe? Gluten free and 100% plant based, these sweet and crispy cookies are a real crowd pleaser! There’s nothing quite like the smell of fresh, oven baked cookies! If I could bottle that smell, I would spend every winter day swaddled in the cozy blanket of that wonderful aroma. And now that my mother has arrived from Japan to spend the holidays with us in Brooklyn – and Ben’s mom will be arriving shortly – I have even more reason to bake up a storm! Well… as we all know, most of the reason for baking is EATING. But it sure doesn’t hurt that baking makes our brownstone smell like a Norman Rockwell painting. These delicious vegan peanut butter cookies will pull double duty in the weeks to come. You see, we’ll be eating these chewy, crispy and moist slabs of perfection to get our holiday cookie quota covered. AND, they’ll also blanket the house in that perfect homemade cookie aroma. Oh – and did I mention that this cookie recipe is gluten free as well? The best part about these vegan cookies is that there aren’t any science-experiment caliber ingredients required to make them 100% plant based. 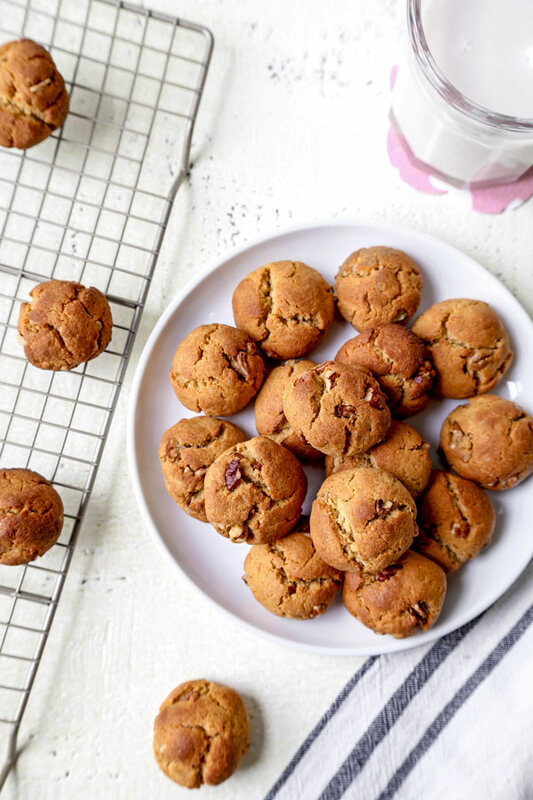 All the ingredients you’ll need to whip up these vegan homemade peanut butter cookies are easy to find – and you may have most of what you’ll need in your pantry already! Can you make peanut butter cookies with no eggs? And it doesn’t mean that you have to add something insanely hard to pronounce to make soft peanut butter cookies without the egg. Why do we put eggs in cookie dough? Simply put, eggs build structure and create stability in dough. And they also provide moisture and fat – all of which results in a rich, chewy tenderness. Plus, there’s nothing easier than a recipe that calls for two eggs. They are a naturally pre-measured ingredient! However, in efforts to keep these sweet vegan peanut butter cookies 100% plant based, I needed an egg substitute that would provide structure AND moisture to my batter. Luckily, I didn’t need to look further than my pantry shelves. You see, I have a vegan egg substitute that is almost as easy to make as an egg is to crack into a mixing bowl. It’s called a flaxseed egg. And it’s glorious! What is a flaxseed egg? A flaxseed egg is just a mixture of ground flaxseed and water. And, while you’d never mistake a bowl of that grainy looking mixture for a bowl of eggs, the end results when you bite into your homemade cookies are uncannily similar. To copycat the effect of the egg for this vegan peanut butter cookie recipe I simply mixed one tablespoon of ground flaxseed with three tablespoons of water. Then, I just let the mixture sit until it became somewhat gelatinous. It did a great job of mimicking an egg’s structure building properties – while delivering a tender chewiness to the finished cookies. And ground flaxseed is not only easy to find on the store shelves – it’s said to be a wonder-food that may combat breast cancer, heart disease and diabetes. Read more about the health benefits of flaxseed here. Furthermore, to see a flaxseed egg in action in a moist vegan banana bread, check out my recipe here. You may just find yourself using flaxseed eggs in your own homemade vegan baking projects from now on! Don’t let the word butter fool you. Peanut butter, in its purest form, is crushed peanuts and salt. Now, some brands will include sugar and oil – or sweeteners like molasses. All of those ingredients are totally fine. However, some peanut butter manufacturers produce flavored PBs – which can use non-vegan ingredients like honey or milk chocolate. This is where the rubber meets the road, so to speak. 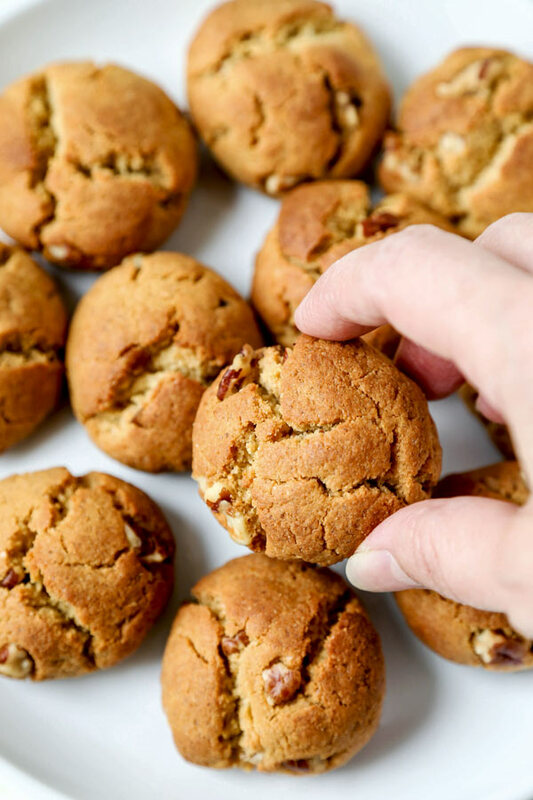 I’m so excited to share this easy peanut butter cookies recipe with you, because it will hopefully demystify vegan cookie recipes in general. You see, while I’m using some items that are atypical for cookies, at the end of the day these are still everyday pantry staples. 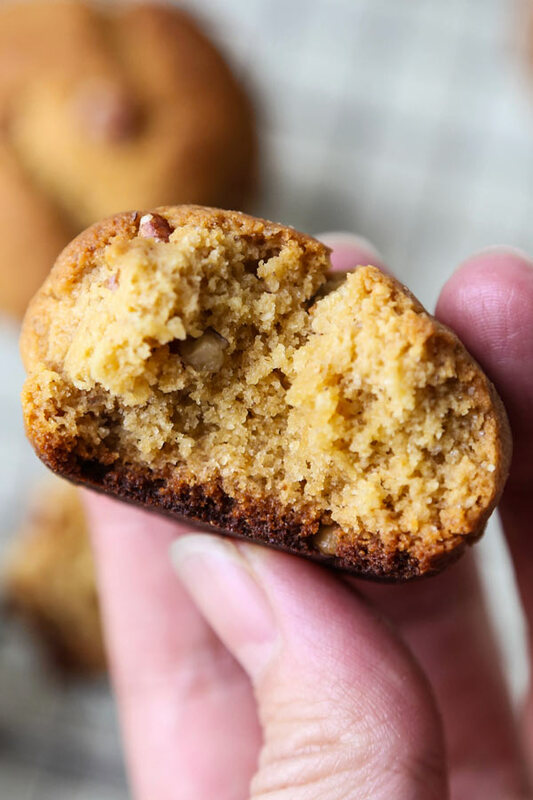 There are no crazy ingredients in these vegan peanut butter cookies! To start, place a quarter cup each of peanut butter and vegan butter in a mixing bowl along with 3 tablespoons of maple syrup. Beat with a hand mixer until smooth. Add ½ cup of brown sugar to the mix – and continue to beat for two minutes. Then, add a teaspoon of vanilla extract and your flaxseed egg and beat for another minute. 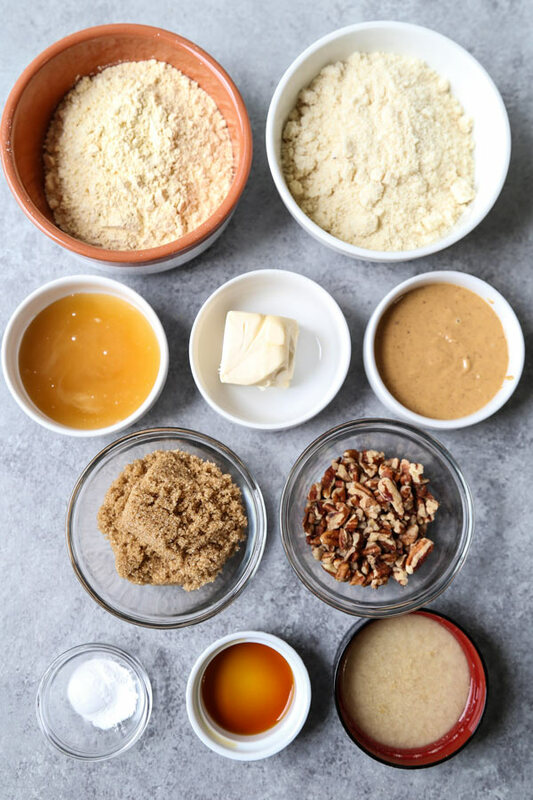 While the mixer is still running, simply add a half-teaspoon each of baking powder and baking soda, a cup of almond meal (aka: almond flour) and a half-cup of chickpea flour. At this point, turn your mixer off. We’ll proceed by hand! 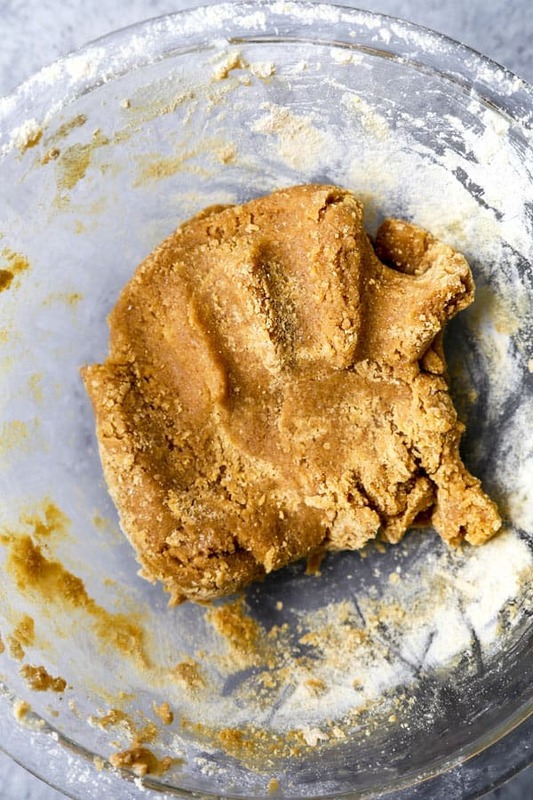 Kneed an additional half-cup of chickpea flour into your cookie dough until it is smooth. Then fold in ⅓ cup of chopped pecans until evenly distributed. 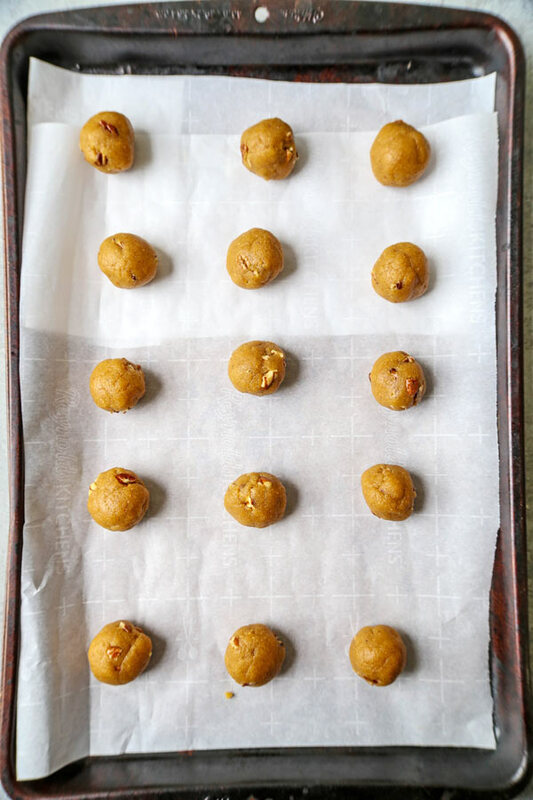 Now, scoop out a tablespoon of cookie dough and form into a ball. Place on a baking sheet topped with parchment paper – and repeat until you’re out of batter. Leave a couple inches between each peanut butter cookie to ensure even cooking. Pop that tray into the oven at 350°F for 12-15 minutes. When the bottoms are golden brown, they’re good to go! Everyone has their favorite brand of peanut butter. Whether it’s a super creamy and sweet version, or a chunky natural peanut butter you’ll need to mix before using, go with your favorite! Personally, regardless of brand, I tend to go with a natural peanut butter with a minimal ingredients list. 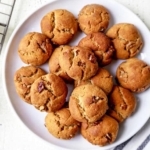 And while chunky peanut butter would be fine to use in this vegan peanut butter cookies recipe, I find that creamy peanut butter delivers the best overall texture to the finished oven-fresh cookies. Now, you’ll easily find all of the ingredients you’ll need to whip up these cookies at your corner grocery store. You’re gonna LOVE these cookies! I promise. Even though completely vegan and gluten free, these peanut butter cookies don’t taste like a compromise. They’re full of all the indulgent flavor you expect when tucking into a plate of peanut butter cookies over the holidays. Are these the best peanut butter cookies? Well, you’ll be the judge of that! If you make them, I’d love to hear your thoughts in the comments! Eat up – and happy holidays, friends! 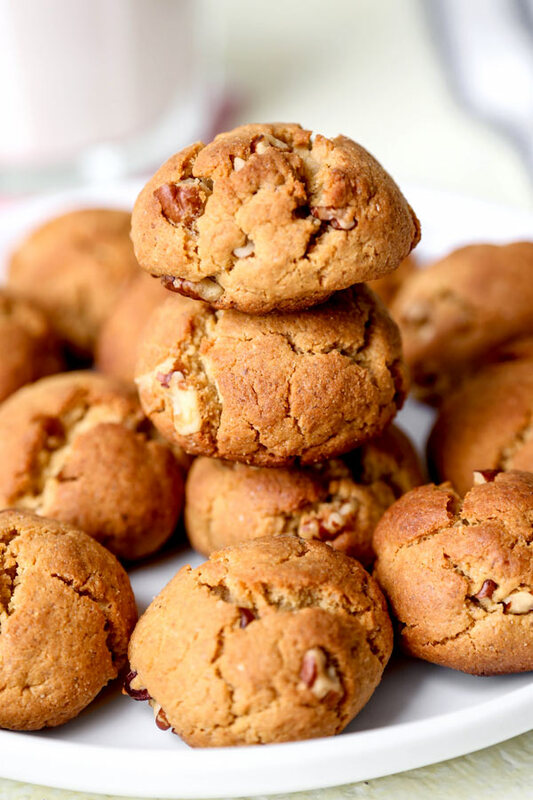 Did you like this Vegan Peanut Butter Cookies Recipe? Are there changes you made that you would like to share? Share your tips and recommendations in the comments section below! The BEST crispy, chewy vegan peanut butter cookies! Gluten free as well. 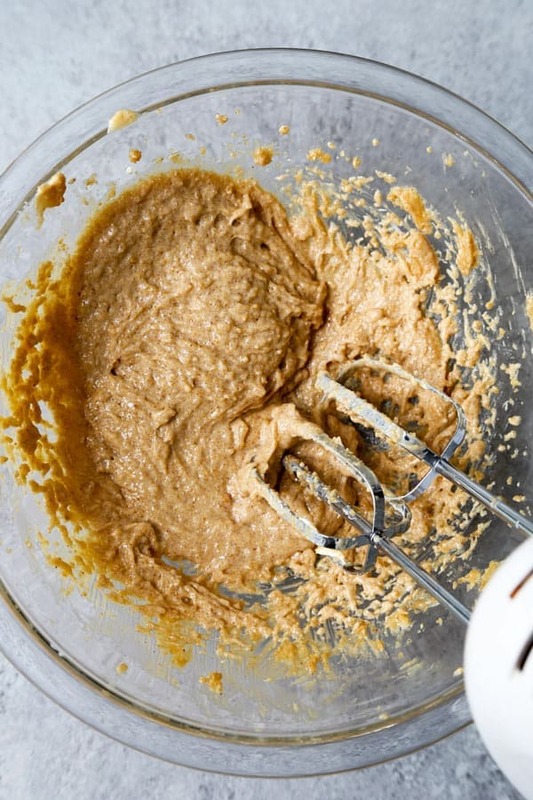 Put the vegan butter, peanut butter and maple syrup in a bowl and beat using a hand mixer until the texture is smooth. Add flaxseed egg and vanilla and beat for 1 minute. Slowly add baking powder, baking soda, almond meal and half of the chickpea flour. Turn the mixer off. At this point the dough may be too hard to mix with a hand mixer so I recommend using your hands to mix the remaining chickpea flour. Knead the dough a few times until it’s smooth. Add the chopped pecans and fold them in using your hands. Scoop up about 1 full tablespoon of the dough and form into a ball. Place it on the parchment paper. Repeat this step until all the dough has been used, leaving about 2 inches of space between each ball. Bake for 12-15 minutes until the bottoms are golden brown. Take out of the oven and let cool for 10 minutes. Transfer to a cooling rack and let cool for an additional 15 minutes. Serve.